Mr. Cain’s main argument against the fact that his plan redistributes wealth from the poor to the rich is that, “it does no such thing.” But what does that mean? Simply stating “it does no such thing” doesn’t satisfy the anxiety. The real concern is that since the top 1% of income earners pay 38% of all income taxes, and because the 9-9-9 Plan reduces their tax rate by 74%, while at the same time exempting empowerment zone residents, that either a greater burden of taxes will be borne by the middle class and working poor, or the United States will go down in flames in a matter of weeks instead of years. So I guess Mr. Cain better hope that the middle class, who are busy working everyday and taxed enough already, aren’t paying too much attention to his claims. But I don’t think that’s the case. Perhaps Mr. Cain needs to go back to the drawing board. 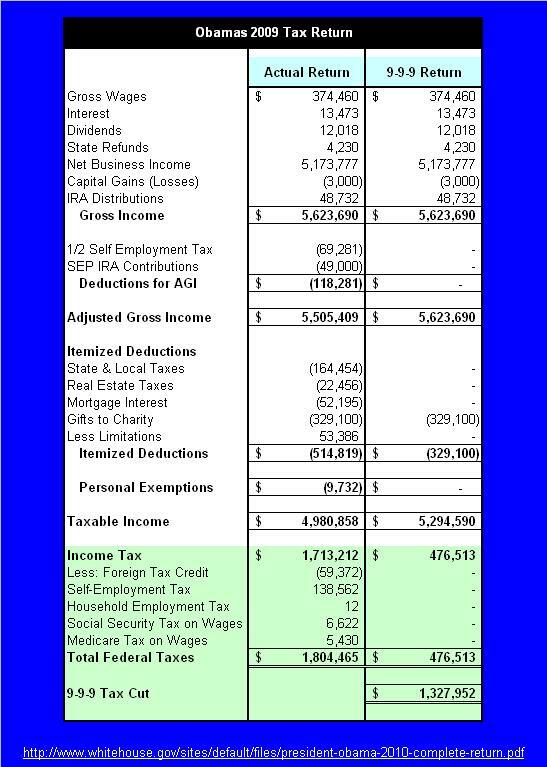 So here’s what the Obamas actual 2009 tax return would look like against the 9-9-9 Plan. When you remove a 15.3% payroll tax, a 35% corporate tax, and a 35% individual tax and replace them with 9-9-9, it doesn’t measure up. In order for the Obamas to make up the shortfall they would have to spend $14,755,022 on items subject to the 9% national sales tax (take the tax cut of $1,327,952 and divide it by 9%). That’s almost 3 times their current gross income. So unless the Obamas run out and buy a new house, or otherwise figure out how to spend 3 times more than they make, on items subject to the sales tax, that revenue will never come back from them. The government will either go broke, or the middle class – 70% of those making $50,000 to $75,000 – will really end up paying $4,326 more in taxes, just like the Tax Policy Center said. As you know (or maybe not), like many others, not all of the Obamas income is from wages paid by an employer. Actually all $374,460 of his wages were paid by US taxpayers. The other 9% tax on his self-employed business income is already included in the table. Obama’s business didn’t really have any expenses, so no sales tax would be collected there. So did taxing the Obamas self-employed business income the other 9% make up the shortfall? No. So will the 9-9-9 Plan tax the federal government for the other 9% on Obama’s wages in addition? No. Does the federal, or do state and local governments even pay income taxes? No. So under the 9-9-9 Plan, what tax return will government entities not be allowed to deduct wages from? When it comes to government workers, their employers will not be paying the other 9%, because their employers don’t pay income taxes. You can add other tax exempt organizations to that list as well. And when it comes to the self-employed, and small business owners, some will benefit and some won’t. Those who make more than $330K will clearly benefit more under 9-9-9, while most everyone else will pay higher taxes. That’s why this dog won’t hunt. By proof, policies have consequences – The 999-Plan will create a host of unintended social problems which naturally occur on the other end of Laffer’s curve. Giving average tax cuts of $487,300 to 95% of people making over $1 million per year, and increasing the tax burden on the working poor and middle-class, solves nothing. Yes I am a conservative, and if you don’t believe it then read the rest of my blog. I’m not too sure how to classify Mr. Cain’s 9-9-9 Plan, but from my point of view, 9-9-9 is not a conservative plan, and not something that conservatives should even be considering. Had Mr. Cain not risked his entire campaign upon this flimsy reed; he might have had my support. But if Herman Cain is somehow able to win the Republican Party nomination, I’ll be casting my vote for the first viable 3rd party candidate.